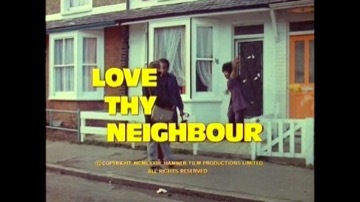 Eddie Booth and his coloured neighbour, Bill Reynolds, are continually sniping at each other with racist taunts, which even continue at the factory where they both work. Finally, the two fall out completely over a union matter and, with their relationship at an all-time low, their wives Joan and Barbie choose this rather inauspicious moment to enter a ‘Love thy Neighbour’ competition! Meanwhile, to make things worse, Bill’s father arrives from Trinidad and seems to get on a bit too well with Eddie’s mum….. Probably the less written the better about this lamentable, tasteless and insulting supposed comedy. Suffice it to say that, in all their long history, Hammer never made anything quite so embarrassingly dreadful! Incidentally, for what it’s worth, the film is a spin-off from an equally dire Thames TV sitcom.